Once the connection is successful the client will ask you for the security token. Copy it from the SSH session and paste it into the dialog box in the client. The next time your server reboots TeamSpeak will start automatically. If you use a firewall the following ports will need to be opened: 9987, 30033, 10011, and 41144. Here’s the commands to open those ports in IPtables. Run each line as a separate command. 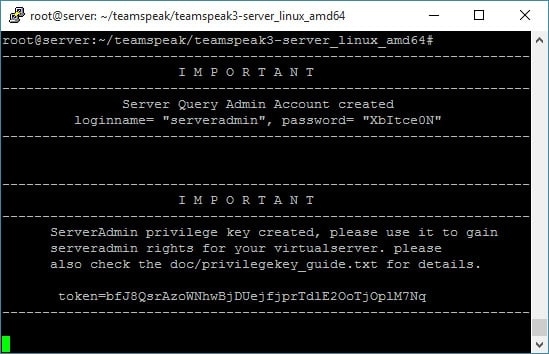 Thats it, TeamSpeak is installed, cofigured to start automatically after server's reboot and ready to be used.